Good water = good beer. 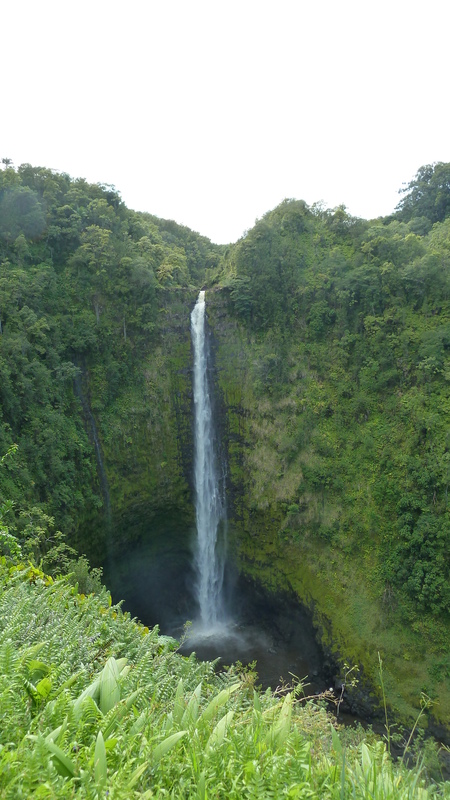 Silly tip: your water doesn’t need to come from a waterfall as seen here (‘Akaka Falls, Hilo region, the Big Island of Hawaii). I didn’t want to start this tech series with the typical brewing water motivation, but here it is anyway (read this as if Ben Stein was reciting this to his high school class). 85-95% of beer is made up of water so unsurprisingly great beer starts with great water. Not only for taste/flavor considerations (for example making sure your source brewing water is good to taste i.e. devoid of off-flavors like chlorine compounds), but also for more technical reasons (for example designing mash water profiles to achieve a suitable mash pH for successful saccrification when brewing all-grain recipes). As a result, homebrewers and pro brewers alike often modify their brewing water in some way to make a well crafted beer. There, I said it. Moving on, this tech post series isn’t intended as a general guide for water modification in the brewing process. Indeed, water modification is quite a complex subject best left to the professionals to instruct; I thoroughly recommend Palmer and Kaminski’s book Water: A Comprehensive Guide for Brewers and the Brulosopher’s homebrew guide to water modification. Instead, I’d like to focus on one particular method of water modification that being the use of reserve osmosis water (RO water for short) in the brewing process and obtaining RO water through home filtration for such purposes. My local Austin tap water is pretty good for most beer recipes. It’s great on its own for extract brews and most all-grain brews with mashes above 10 SRM (or so) without much fuss. It also tastes pretty good on its own (nearly balanced chloride to sulfate ratio); just remove the chloramines with a bit of metabisulfite and away you go. The only real trouble is that it’s a bit on the alkaline side (due to carbonates), making it less than desirable for paler colored brews, which I tend to brew often. While adjustments through brewing salts certainly help push down the residual alkalinity enough for beers in 7-10 SRM range, for the palest color brews, treating/modifying Austin water is more involved (managing hardness, requiring acids, etc. ), which for me is often not worth the effort, and instead easier to start with a clean slate through a nearly pure RO water source as my base water, and from this, building up custom mineral profiles. In addition, I find RO water useful in other aspects in the brewing process (for example the sparge, topping off the kettle, mixing Star San cleaning solutions, etc. ), thus I routinely use RO water throughout my brewing process (more info on the general roles of RO water in the brewing process to come later). For many homebrewers, obtaining RO water is as easy as heading down to your nearby corner store, filling up a carboy, and hauling it back home. On top of that, RO water is also very affordable, often costing about a buck to fill a 5-gallon carboy. However, for apartment brewers, RO water can be surprisingly less accessible than their housed counterparts. For me, after several dozens of batches, I finally became tired of transporting and carrying gallons of RO water up several flights of stairs to my third floor apartment. Similarly, for others living in urban centers, RO water hauls are less feasible, especially those utilizing public transport. In addition, home delivery of filtered water products can be convenient, yet on the pricey side. Whatever the reason may be, using RO water in apartment brewing is generally less straightforward than for housed counterparts. Countertop RO filtration system. More on this later. This leaves open a question: does it need to be? While the use of RO water is definitely not necessary to brew great beer, apartment brewers can find a level of convenience and affordability by generating RO water straight from their kitchen faucets. Originally, my assumptions regarding home filtration of RO water was that at the apartment scale, RO filtration was way beyond reach. Somewhat blindly, I falsely assumed that RO systems were very expensive and space consuming. However, after doing a bit of research, I was pleasantly surprised to find that not only are RO water filtration systems relatively compact and apartment compatible, but also very affordable. From this find (and more or less the topic of this tech series), I recently obtained a countertop RO filtration system (produced by APEC and no they are not sponsoring this post) for brewing and general drinking purposes. Since then, I have been very pleased with my purchase, cranking out some great tasting brews completely utilizing the Austin tap filtered RO water. New Apartment Brewing Tech Series! Going forward, while RO water is hardly a requirement in making great homebrew, I hope this tech series may motivate you to try some of the RO water techniques described here in your brewing process, and perhaps if you are silly enough, acquire your own countertop RO filtration system for apartment brewing. 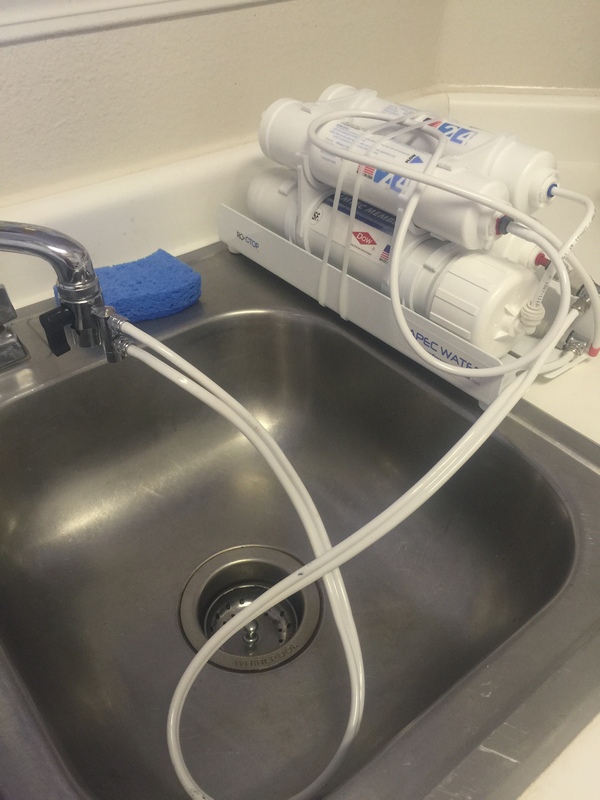 Do you use RO water in your brewing process and do you have a home RO filtration system? Leave your experiences in the comment section below. Cheers and happy brewing! Looks like a nice compact system. Looking at the specs it seems to be about 3.75 gallons per hour. Does that mean you have to run out your RO for 3 hours before you can start brew day? Seems like that would waste a lot of water no? Hey Eric, thanks for reading and also great questions! I intend to directly address these points later in subsequent posts within this series, but will mention them now. (warning: this response is a bit TL;DR). 1) Yes, this RO system is very (very) slow since it works off the faucet water pressure. I’ve timed out this system and it takes ~90 minutes to fill up one 5-gallon carboy. I typically fill up a carboy prior to brew day (I usually have brew day prep the day before, mostly cleaning, bagging grains, double checking recipe, etc.). Since I typically brew small batches; one 5-gallon carboy is sufficient for most recipes. 2) As for the water waste, that’s up to brewer’s lifestyle and local watershed. Low-end RO systems typically run at 3:1 (brine to RO ratio), meaning ~15 gallons of brine water is generated for every 5 gallons of RO water produced. Unfortunately, many under-the-sink models feed the brine water straight to the drain; however, this nice countertop model provides direct access of the brine water which (with some brewing ingenuity) can be recaptured for other purposes (I use it for PBW carboy and keg soaks; also the brine waste isn’t very mineral dense. As measured by TDS, it barely passes as mineral water at ~270 ppm). For those who have some extra dough, more advanced RO systems can repump the light brine waste through the RO system to lower brine to RO ratio and create an overall more water waste efficient filter, although these are less practical for the apartment brewer. On a slightly related note, I’m quite the advocate for reducing the water waste throughout the brewing process (see this earlier post here: https://theapthomebrewer.com/2014/02/28/brewing-question-what-is-water-to-beer-ratio/). Homebrewers can do their part to focus on the 3Rs of water waste and hopefully implement unique water saving ways throughout the brewing process (especially those in extreme drought regions; Austin was in one between 2011-2014 and still sort of are)! Enter your email address to follow the Apartment Homebrewer and receive notifications of new posts by email.